Grip-on Tools Electric ATV Winch, 3000-lb. Whether removing a small stump or pulling your crazy friend out of the mud, again, the Grip Tools Electric ATV Winch has you covered with 3,000-lbs. of pulling power. It can be used on your ATV / UTV, SUV, or tractor, expanding the number of ways it can be used. The ratchet crank provides you with a smooth, consistent pull use after use. Plus, using the Winch has become even easier, thanks to the wireless remote control. The remote control allows you to stay with the item you're pulling and check for a firm, tight hold, time after time. Everything you need to get unstuck. 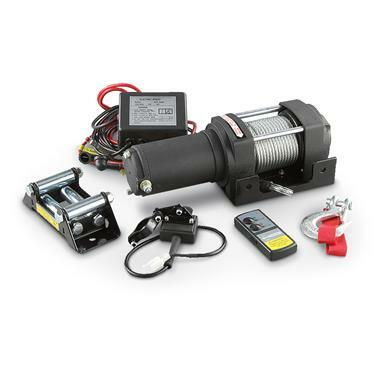 This winch comes with all the materials necessary to hook it up and begin winching. The cable is 49 ft. of 3/16" ga. drop forged, galvanized steel with a galvanized steel clevis grab hook for powerful strength and durability. It also includes the 12V DC hookup wires necessary to supply it with electricity. Don't worry guys, you can't mess it up. You'll also receive the above mentioned remote control for ease of use. All of this, plus 3,000-lbs of pulling power, Grip Tools sure knew what they were doing when they made this Winch. Measures approx. 12.5" x 4" x 4"h.
Hook it up and order today! Mounting bolt pattern: 3.1" x 5.1"
Dimensions: 12.5" x 4" x 4"h.